To accommodate the growing need for separate practice venues for the men’s and women’s basketball teams, and simultaneously to create a competition center for women’s volleyball, a new athletic practice facility was commissioned by the University of South Carolina. A site was chosen adjacent to the existing Coliseum as a natural location for a new two-court gymnasium, coaches’ offices, and meeting and support space. Working with a full-story change in topography, the building acts as an extension of the 35-foot high base of the Coliseum, engaging itself into the hill and becoming a passive partner to the main arena. The parti for the building is a tri-partite scheme, with the gymnasium mass separated from the coaches’ wing with a glass atrium lobby. 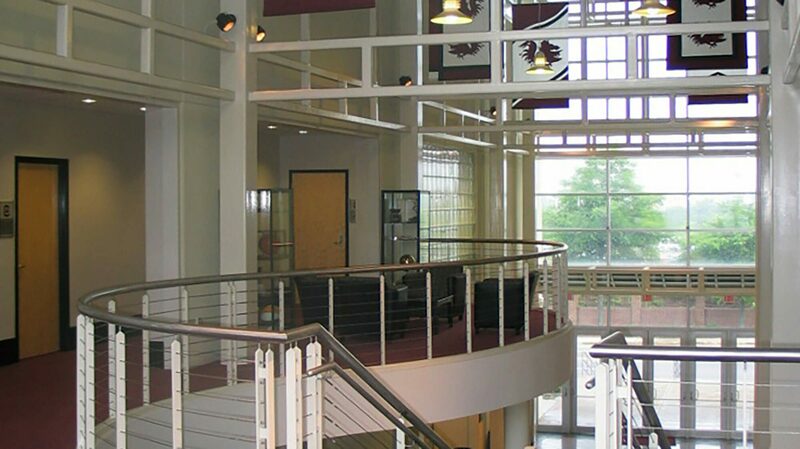 This copper-vaulted mass rises above the functional areas to create a distinct point of entry from both sides and negotiates the one-story level change with a stainless-steel cable railing system and serpentine stair within. Exposed steel and precast concrete panels permeate the structure, at once displaying careful attention to detail while highlighting the utilitarian nature of the facility itself.